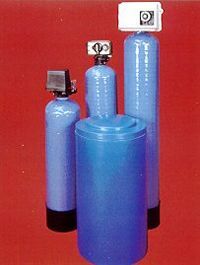 Water softening by "ion exchange" is the only economical way to remove the calcium & magnesium that cause scale in water. The cost of hard water damage can run in to £1000s per year. If you use hard water in your business you are wasting money. Soft water increases the efficiency of any machine or mechanical process that uses water. Down time, repair & maintenance costs are reduced. Product quality increases and labour costs are reduced. Restaurant, hotel, food processing, washing, cleaning, heating, chemicals whatever your business soft water is an advantage. 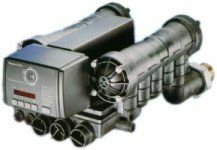 Pipe sizes from 3/4" to 3"
Autotrol's Magnum Cv valve in 1.5" & 2" variants. Controlers include Time Clock, Metered, Twintank alternating or paralel, Triplex parallel. Flow rates up to 22.3cu/m/h. Systems, valves & spares availble. Autotrol's Performa valve with 1" connections. Controls availble, Time Clock & Electronic Metered. Flow rates up 7.3 cu/m/h.